What I’ve Been Enjoying –1. I’ve loved being home. All is well with Susan, Nathan, and all is well in the womb with Baby G. Just went to another appointment and all is pretty good. 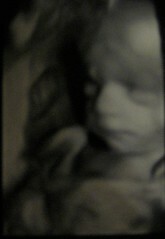 To the right is a fairly recent 4-D sonogram pic. I’ve never been so happy to see my nose. Not worried, he’ll still get enough of his mom’s genes to be cute. 2. Still enjoying the afterglow of our mission trip and trying to apply what I’ve gained from our Nassau experience. What I Was Disappointed By – I know I shouldn’t be surprised but every time I hear about steroids or performance enhancing drugs (PEDs), I get frustrated. I think part of it is that people like myself have sought refuge in sports pretending it’s the last place of purity but we’ve always been kidding ourselves, nothing is pure. Speaking as a Yankee fan, I can’t help but think of Game 4 in the 2003 ALCS. I know a lot of baseball was on something but Mariano wasn’t and if you know baseball, you know that’s true. What I’m Reading – Still reading the last half of 1.2 of Barth’s Dogamtics that should have been completed almost 2 weeks ago for our independent study. Just found Enough last night and plan on finishing that soon. About to start Rob Bell’s Drops Like Stars. What I’m Listening to – new Derek Webb, new Wilco, Homebrewed Christianity Podcast with Robert Wright and catching up on Relevant podcasts. Student Ministry Update – It’s been great to hear all the wonderful things said about our mission trip. A lot of time, work, prayer, support went into that and I am not taking these good things for granted. A lot of positive things were expressed by our students, one I hope to share about one day, and while I still have concerns for short term missions (they are not an end), I’ve been really moved by our last couple especially. Now on to planning the new year, cleaning out files, catching up on all the stuff before the mayhem begins again!